An editor has hailed an “amazing” public response after launching a new free weekly which will compete with the newspapers he used to run. Newsquest has launched the Eastbourne Independent with editor Peter Lindsey at the helm, who previously led the Johnston Press-owned Eastbourne Herald and Eastbourne Gazette. The new title has started life as part of a newspaper war in the seaside town and comes after the Gazette last week made the switch from tabloid to broadsheet as part of a relaunch. That follows Johnston Press buying the free weekly Brighton & Hove Independent in July, which runs in competition with Newsquest’s The Argus. 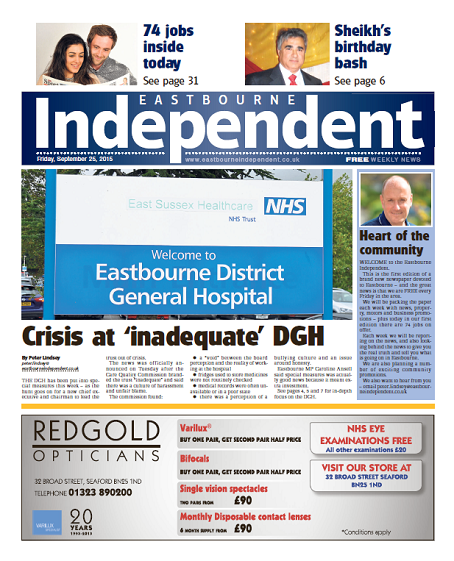 The first edition of the Eastbourne Independent, pictured above, hit the streets on Friday with an initial print run of 13,500. Peter said: “We are delighted with the first edition and the public response has been just amazing. “I was at a business event on Friday and everyone was talking about the Independent. “I am more convinced than ever that there is room – and indeed the demand – for a new fresh free newspaper in this wonderful town. Rome wasn’t built in a day but we have a base, we have a start, and the only way is most certainly up. “Our main focus for week one was the hospital falling into Special Measures, and we covered that in a very detailed way because of its significance to the town. The first edition of the Independent is 32 pages and is being distributed at supermarkets and other outlets across the Sussex town. Peter previously worked as group editor at JP, working at the Crawley Observer, Sussex Express series, Eastbourne Herald and Gazette and Hastings Observer series but he lost his job in 2009 as part of cost-cutting measures. Since leaving the regional publisher, Peter has worked as a journalism course leader at City College Brighton and Hove. The boy Lindsey uses the word “amazing” with tongue firmly in cheek I suspect. It is the same over-the-top word the new-look Gazette’s long distance editor Gary Shipton used to describe reaction to his company’s revamped broadsheet. Amazing…..it’s the new exciting. Nothing says ‘pick me up!’ better than a large picture of a sign. A hospital sign for your launch edition splash pic? A quality free newspaper is just what Eastbourne needs. The Gazette’s relaunch as a broadsheet has been an absolute disaster. Meanwhile the Herald has been resting on its laurels for far too long. It’s been drifting since Peter Austin retired and has not had a dedicated editor. Newsquest really seem to mean business and it will be interesting to see how they will develop the Eastbourne Indy. Oh, Peter, what an ugly picture to dump on your first front page (and I’m not referring to your mugshot). If it looks attractive to you, perhaps you need to visit the opticians advertised at the bottom of the page. Good luck with the venture. Shame about that awful pic I do agree – but good luck to this new venture in such gloomy times for local newspapers. Makes a welcome change. But surely I’ve seen that masthead before! On the Sunday Independent down in the West Country? Might they be related in some way? Looks poor, but, it’s FREE. Should have gone with a whole front page with a bright picture saying, Hello we are your new local paper and we are free, pick me up and take home for a good read. If anyone thinks what any town needs these days is a free paper then they must have been living in a cave for the past 5 years. Very best wishes, but the front page really is dreadful. Quite why anyone would invest hard earned money into launching a local free paper these days when so much has moved on in terms of how people read news is really beyond me. High levels of advertising revenues are needed to sustain a properly run operation and with more and more competitors vying for business ad budgets only those that can deliver a targeted audience will win out, the old days of throwing high volumes of free papers out there in the vain hope that advertisers will get enough response to advertise again are gone which without them leaves any free paper in limbo: carry on and increase costs or pull up stumps and move out losing what you’ve put in so far. Either way it’s a risky business. Dave S… I thought the Eastbourne Independent was a newspaper… Wouldn’t it therefore be a good idea to put news on the front page? Apart from the picture, it is a strong front page lead.